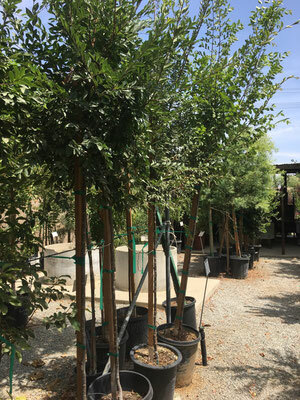 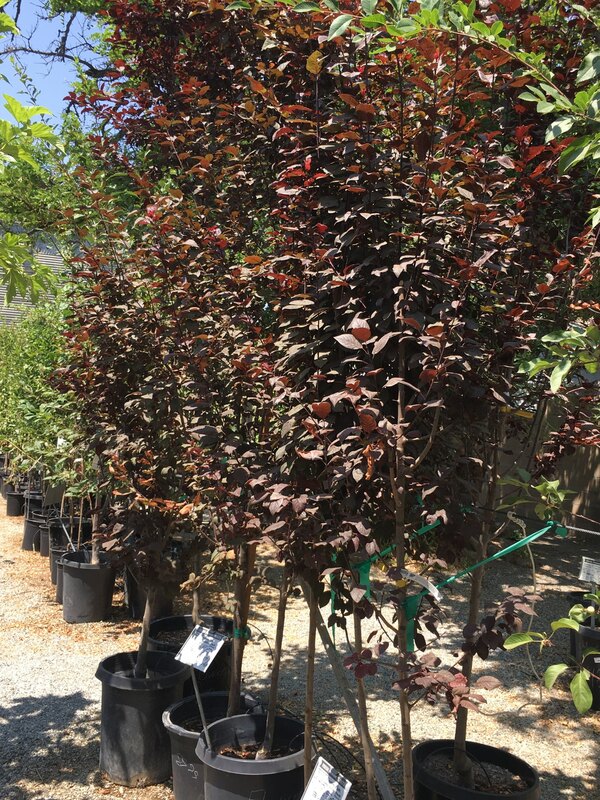 We have many varieties of shade trees available. 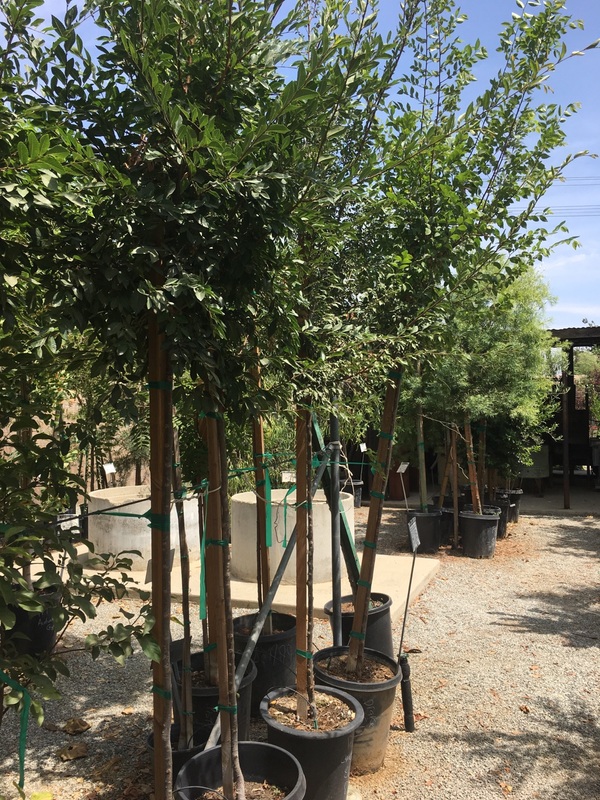 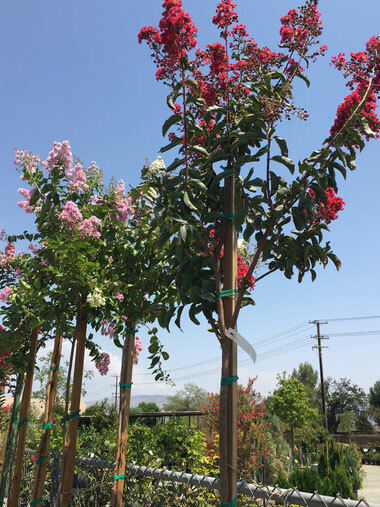 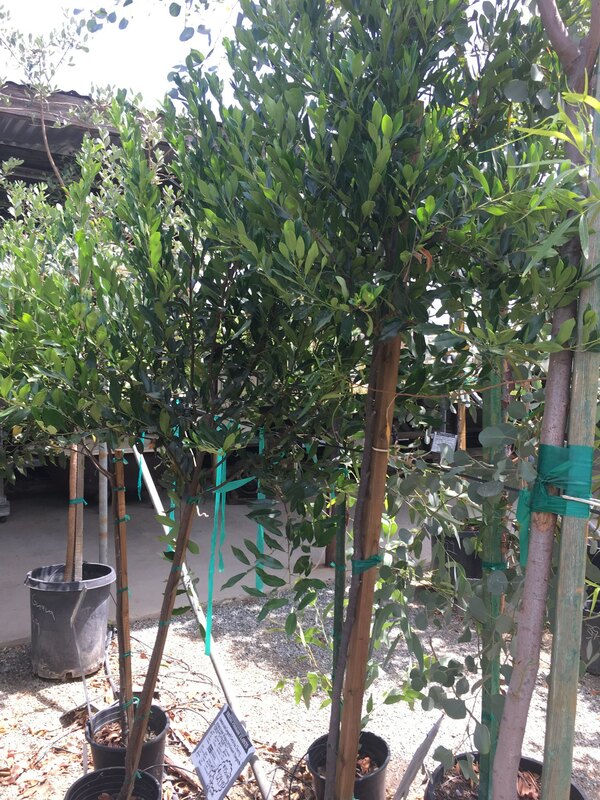 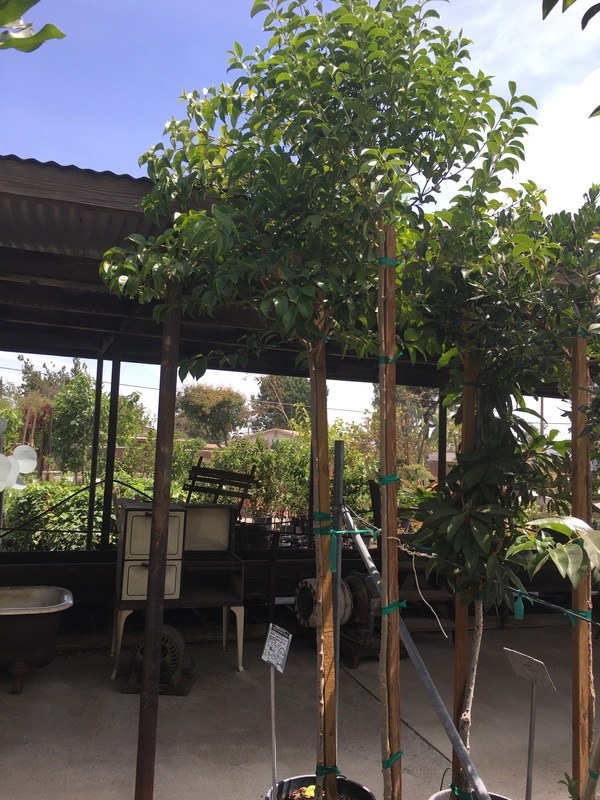 Listed below are some of the trees we carry, including the most popular and best varieties for our area. 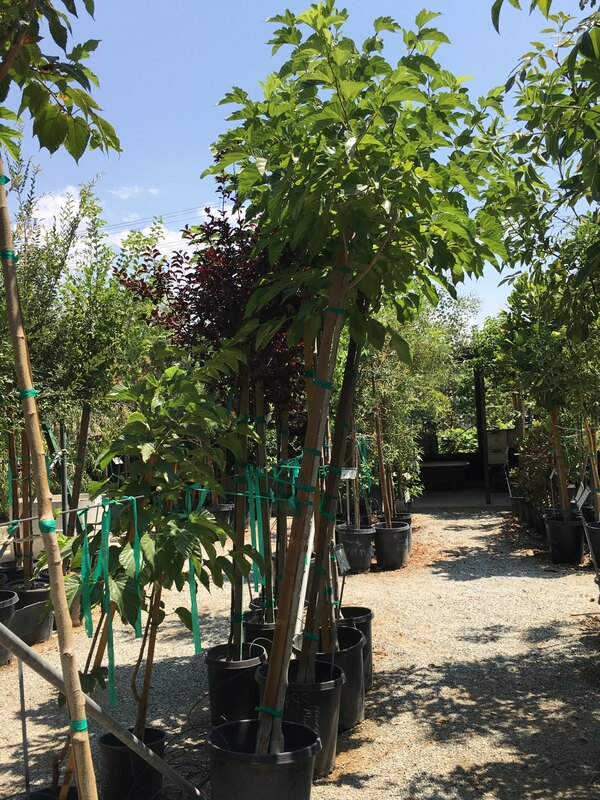 If you are looking for a particular tree, please call us for availability and pricing. 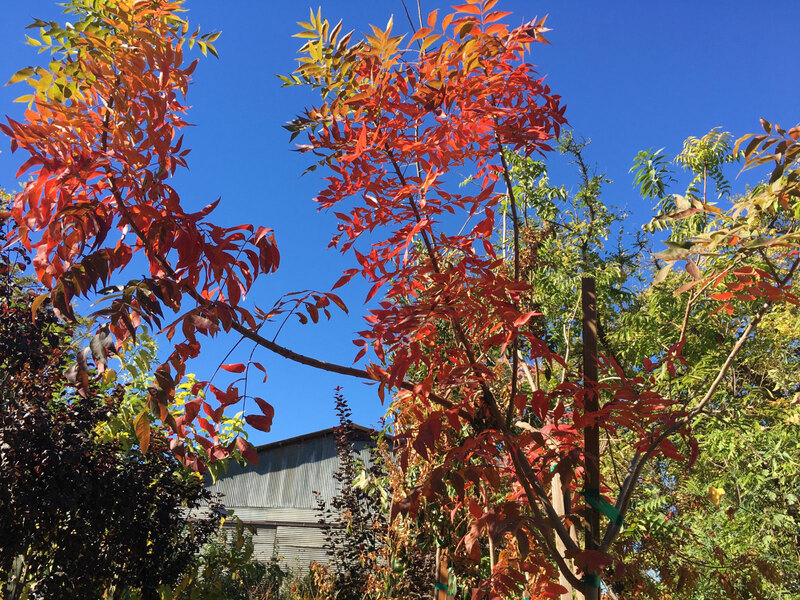 These are trees that shed their leaves for the winter, rather than throughout the year like evergreen trees do. 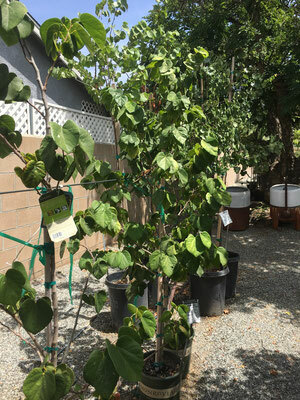 Some good selections for our area are Fruitless Mulberry and Raywood Ash (pictured above), Chinese Pistache, Drake's Chinese Elm, and Tipu Tree (pictured below). 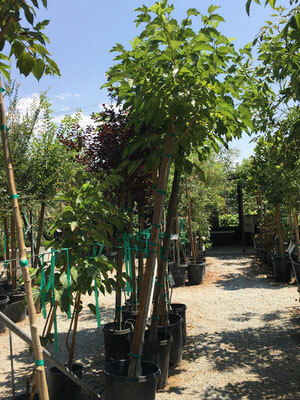 These are large trees, reaching 40 ft. or more in height and width. 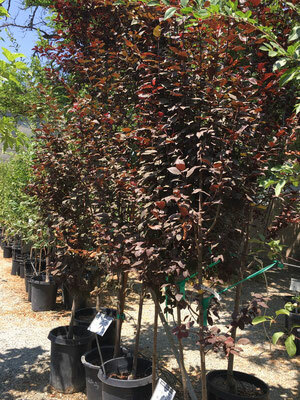 Some good deciduous trees for a small yard are Crape Myrtles, Redbud trees, and Flowering Plums. 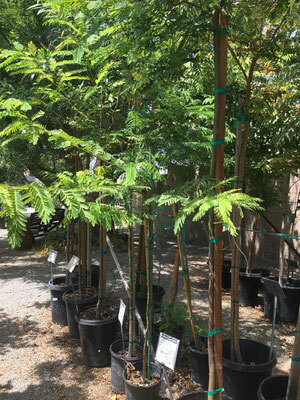 These trees reach between 15-20 ft. tall, and 12-15 feet wide. 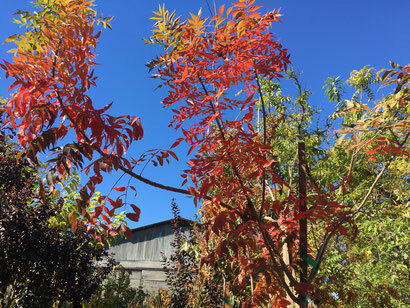 These are trees that have leaves year round. They shed older leaves mainly in spring and fall. 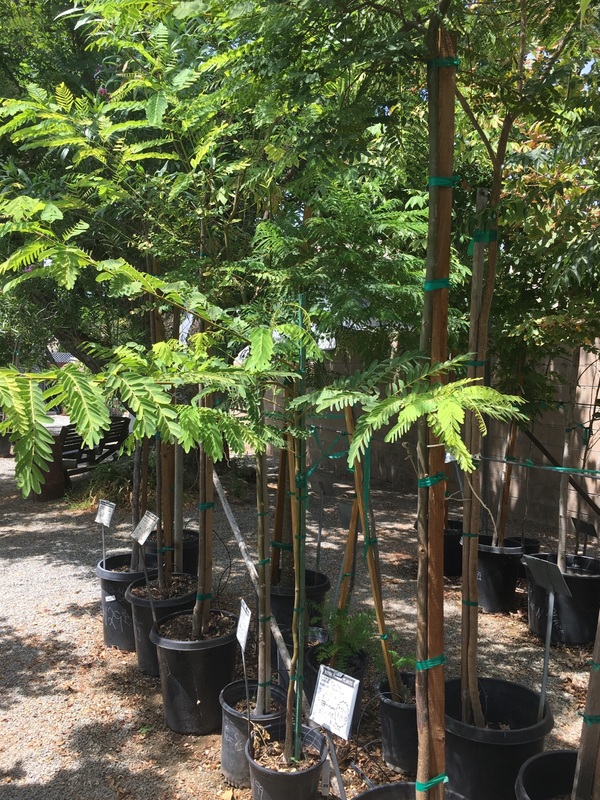 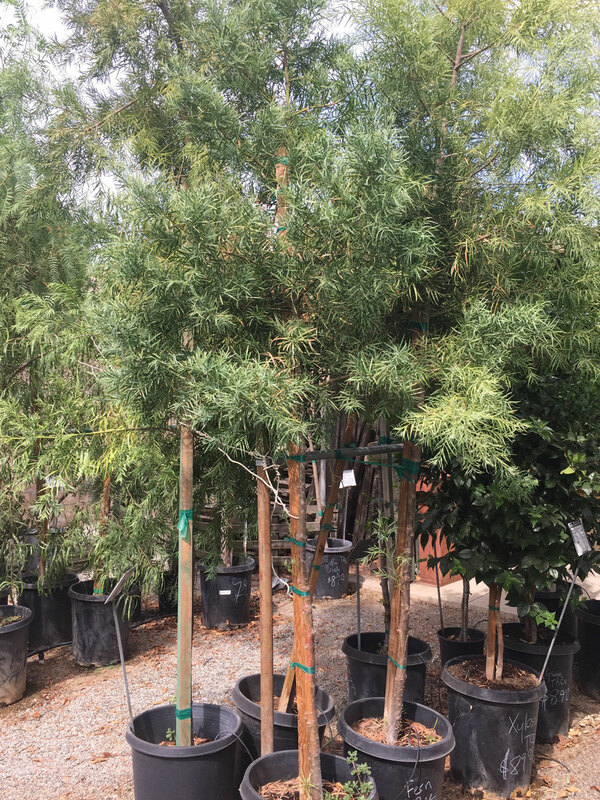 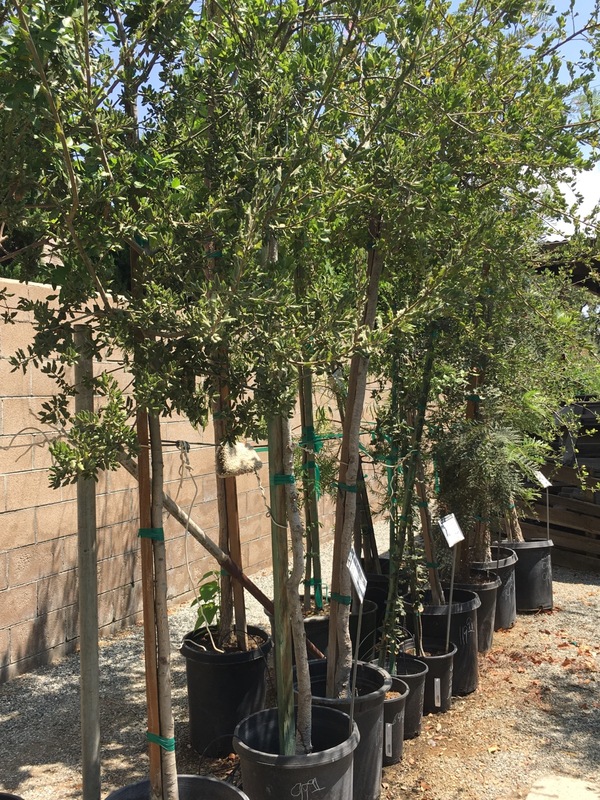 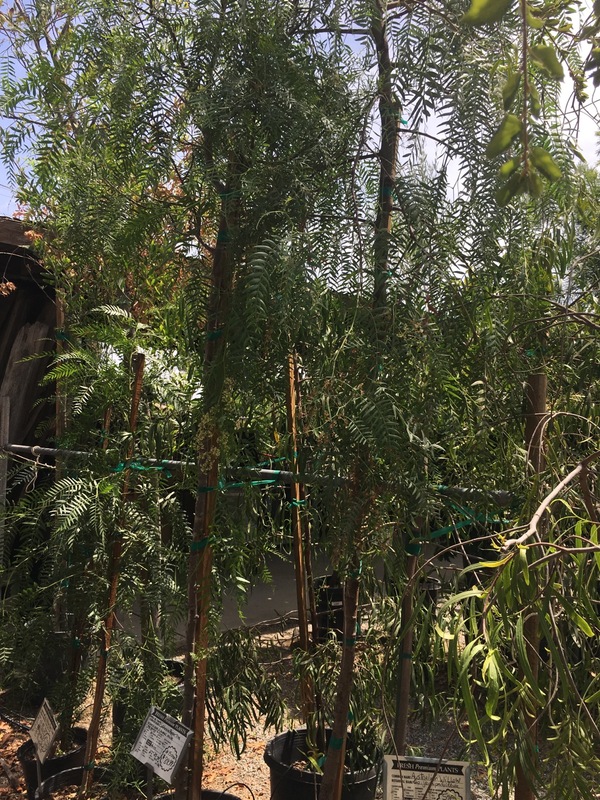 Some larger shade trees we recommend are Oaks (including Live Oak and Cork Oak), California Pepper Tree, and Fern Pines (these are not an actual pine tree). 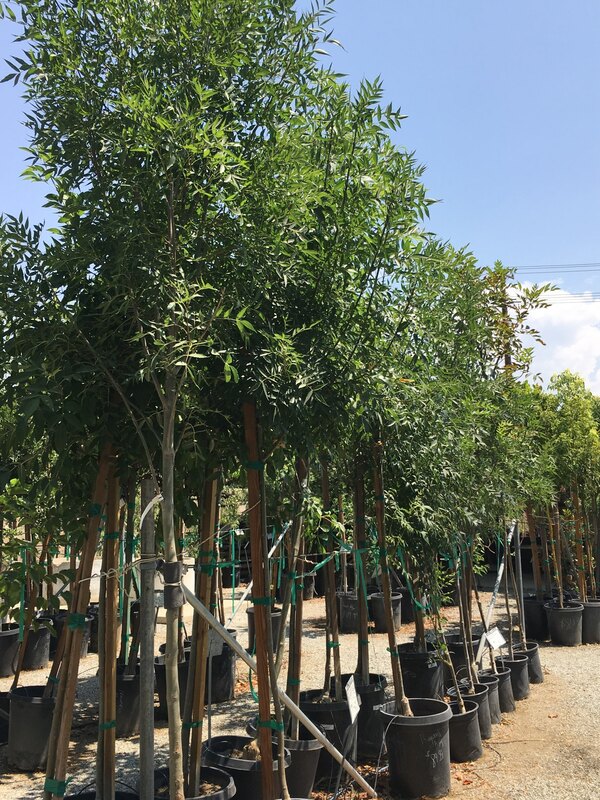 These trees can reach 40 feet or more tall and wide. 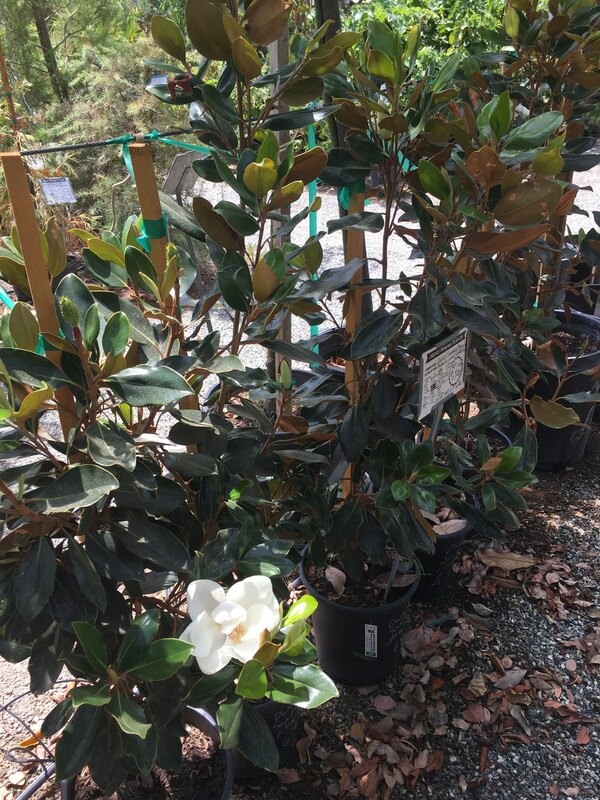 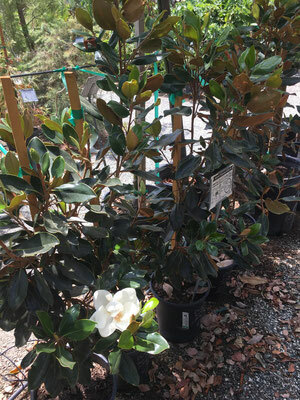 Some good evergreen trees for a small yard are Japanese Privet, Compact Carolina Cherry, and Dwarf Southern Magnolia (all pictured below). 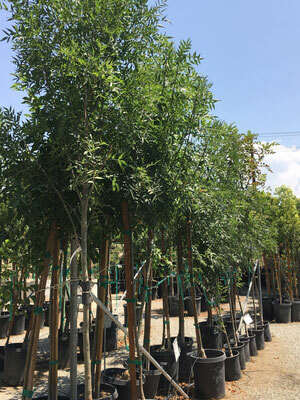 Japanese Privet trees reach about 12 ft. tall and 8 ft. wide maximum, Compact Carolina Cherries get 10 ft. tall and 8 ft. wide, and Dwarf Southern Magnolias slowly grow to 20 ft. tall and 15 ft. wide.